Astrid Bachmann, Deputy Spokesperson, and Silvia Olp, Director of Communications at Phoenix Design, accepted the coveted award for the brand’s anniversary collection during the official opening ceremony for the trade fair. Developed in collaboration with Phoenix Design, the collection is fittingly one of just 31 products named “Best of Best” by the jury. “With its clear, rectangular design, the elegant faucet is a harmonious addition to many bathroom environments. The plate comes in a variety of materials, offering a wonderful, refreshingly innovative option for adding a personal touch to the bathroom,” says the jury. 25 years after its inception, AXOR presented its anniversary collection AXOR MyEdition – a new dimension in individualization – at Salone del Mobile 2018 in Milan. The collection breaks new ground with its clear design and fulfills the desire for uniqueness with its customizable concept. Also innovative is its spray: PowderRain – a sensual feel on the skin – in a sink faucet for the first time. The collection consists of nine products for the sink, for the bidet, and for the bathtub. The clear, linear design sets the stage for personal fulfillment and individual creativity. The faucets feature two product components: body and plate. The faucets come standard in chrome/mirror glass and chrome/black glass, but if desired can also be manufactured in a combination of 15 AXOR FinishPlus PVD surfaces and exclusive AXOR Signature materials such as metal, wood, marble, and leather. With more than 225 design variations, the anniversary collection of the AXOR brand seizes on the megatrend of individualization. “Making a personal statement with individual interiors – that’s nothing short of luxury. 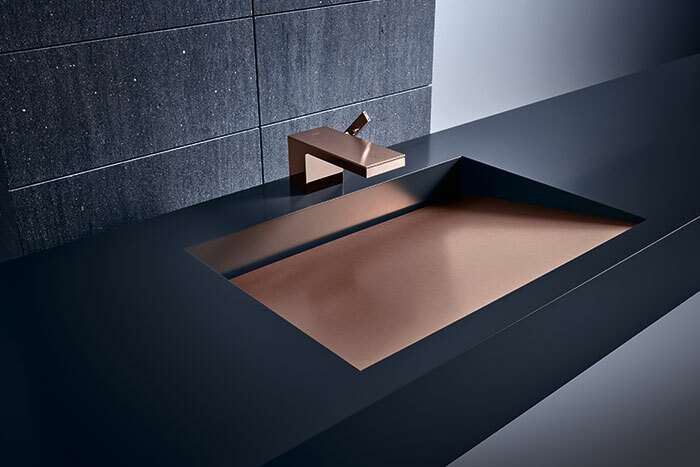 With the AXOR MyEdition collection, we’ve set the stage for individual creativity – colors, materials, and patterns are the smallest common denominator for a tailored faucet,” says Andreas Diefenbach of Phoenix Design. Discovering and awarding the best out of all the areas of interior design is the aim of the ICONIC AWARDS: Innovative Interior. The competition looks at all of the companies in the interior design industries as well as their partners. The ICONIC AWARDS: Innovative Interior pursue a comprehensive design standard: furniture, lights, and faucets are no longer viewed as solitary components, but rather as design elements of a comprehensive presentation. The result is a highly detailed interior design that provides its inhabitants with an unrivalled ambience and unique expression. From the lights and door handles to the silverware, partitions, and textiles, the individual elements of these comprehensive home environments are each designed with a great deal of attention and care. With nine categories, the ICONIC AWARDS: Innovative Interior provide the entire world of interior design with a forum: furniture, outdoor products, bathroom and wellness, office and workspace, building facilities, wall, floor, ceiling, kitchen and household, lights, and textiles. To request more information from Hansgrohe SE, please complete the form below.